You really have to wonder who's in charge at the BBC these days? 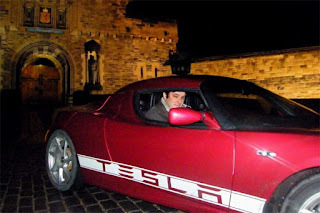 The technology news department dedicates 4 days of coverage to a negative publicity stunt that involved driving a field testing battery powered electric vehicle, designed for urban driving, from London to Edinburgh? That could only be described as an anti-technology story surely? Reporter Brian Milligan set out to make the 484-mile journey using only publicly available charging infrastructure, making eight stops and spending about 46 hours of his total trip sleeping and waiting for the Mini E to refill its battery. It took him four-days. According to Google Maps, the distance between the city centers of London and Edinburgh is 625 km. Less than 2 weeks ago we reported on a Tesla owner from Texas who recorded a distance of 555.5 km in a bog standard Tesla Roadster on a single charge. That's only 70 km short of the full distance between London and Edinburgh. In fact, over the last 12 months we have reported on several battery powered EVs having set single charge distance records close to or exceeding the week long BBC trip. Back in 1996 the unofficial World Record was set by the Solectria Sunrise with 604 km on a single charge using older technology Nickel metal hydride (NiMH) batteries. Last October a German team also covered 600km on a single charge driving an Audi A2. The furthest distance on a single charge to date falls to the Japan Electric Vehicle Club who covered 1000 km in a Sanyo sponsored Daihatsu Mira. The BBC stunt seems to be a fairly heavy handed hatchet job on a technology that has yet to deliver it's first mass market car in the UK. Despite Mr Milligan's repeated claims that the Mini E he drove is 'mass market', it certainly is nothing of the sort! The Mini E is a field testing vehicle run as part of BMW's "Project i". There are only 40 such vehicles on the roads in the UK and they are all owned by BMW with short term leases to nominated testers, hardly a "mass market" vehicle! These cars are quite obviously designed for and intended to be primarily used for urban driving not intercity travel. With 89% of the UK population living in Urban areas a typical 160 km range EV should be a practical alternative to ICE powered vehciles for the majority of UK households. It is such early days in the roll out of true 'mass market' EVs, like the Nissan Leaf, that this stage can be compared to the early days of cellphones. Early cellphones were analogue and had a nickel-cadmium (NiCad) battery that suffered charge 'memory' problems. The battery was so inadequate they were unable to see out an 8 hour day on stand-by. Quite a few development generations later, digital cellphones with lithium ion batteries can last over 350 hours on stand-by no problem. That's a 60-fold improvment! Nissan already have the next generation of battery technology in their pipeline with plans to introduce it in as little as 4 years from now. The new batteries will use a lithium nickel manganese cobalt oxide cathode developed in-house by NEC. Nissan estimates that the battery will cost the same as conventional lithium ion batteries and will be able to power a Leaf for 300 kilometers on a single charge, approx twice the current distance. As the Leaf comes with a Level 3 480v charging socket fitted as standard, a Nissan with their next generation battery could cover the BBC trip in 1 day with just one 20 min quick charge at a half distance rest halt. Compared to most of the world, the UK has a huge lead in the introduction of EVs. Even with fewer than 2000 registered EVs on the road, the UK is approaching 4,000 public charging posts across the country. Instead of getting behind this effort, the BBC, seemingly like a spoilt child, is trying as aggressively as possible to vanalize this lead, performing a genuine public disservice. We only need to know who is paying his "Bill Bill Count".